UNPL2008 » Unitrack Industries, Inc.
Aluminum strength with the insulation of polycarbonate available with studs or clips. For the ease of installation, studs can be placed to suit your cage. 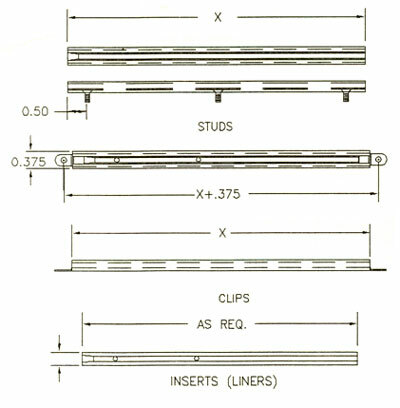 Guides up to 6″ long: 2 clips, or 2 studs spaced 1/2″ from each end of the guide. Guides up to 10″ long: 2 clips, or 3 studs evenly spaced with the end holes or hardware 1/2″ from each end of the guide. 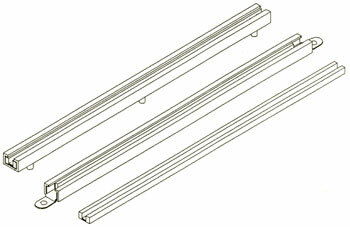 Guides over 10″ long: 2 clips, or 4 studs evenly spaced with the end studs or hardware 1/2″ from each end of the guide. UNPL2008-6 would be an assembled unit of: 6″ long GB1008 Guide Bar; one 5.5″ long Plastic Insert and two MC1000 mounting clips. Mounting hole centers would be 6.375″.